Painting from the historical park of Sukhothai in Thailand, Sukum Ruangdech offers the image of a beautiful "peacock tree," characterized by its vibrant, orange flowers. 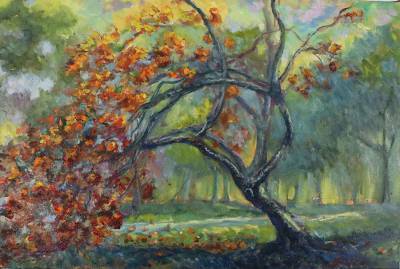 Sukum paints with oils in an impressionist style, capturing the essence of the tree by combining different forms and hues. You can find 'peacock Flower in the Park' by Sukum Ruangdech in paintings categories such as Landscape Paintings, Leaf and Tree Paintings, Impressionist Paintings and Oil Paint Paintings. Enjoy exploring these sections for other Novica treasures. "One day, I met a painting professor. He suggested, 'If you love art but didn't study it, you can still paint!'" "I'm Sukum Ruangdech but can call me Aeh. I was born in 1972 in Northern Thailand. I grew up here and finished high school in an industrial science program. Then I moved to the city to study in the university. "When I was young, I knew I liked painting but later I chose the industrial science program. I also attended drafting class where I realized how much I really love painting. I told my parents I wanted to continue studying in a university art school but they disagreed so I chose mass communications instead. "In my mass media courses, I studied many things such as publishing, photography, making a documentary, writing articles and my courses included a design class. After graduating, I moved to Bangkok and worked in a publishing company where I had to interview many people from many different careers. "Later, I moved to Sukhothai to work in the government service where I ran into an old friend, my art teacher. We had a good time chatting and, when he saw my painting, he offered to teach me oil color techniques and element of painting. "After that, I practiced seriously, painting places like the old city, ancient ruins, temples and landscapes. I had already researched the history of these places because I love traveling, so all historic sites help me find inspiration for my art. "I'm not so good at portraits because I don't think I have enough knowledge. I took five years collecting and practicing my own works and I participated in activities with the local artist community. Mostly there were art exhibitions and I thought this could expand my vision about the world of art because I used to paint alone and never exhibited anywhere, so I never knew how proficient I am. "Thanks to these exhibits, I sold some of my works to a foreigner who led me to meet Parinya, a Novica-featured artist. Parinya introduced me to sell my works here and I hope my art becomes known worldwide. Thank you."